There are several options for spray foam kits on the market today, each designed to meet specific demands in an industry where wear and tear is the norm. The U2-120 by Touch N Seal is perfect for all types of jobs, including residential, industrial, commercial, and institutional sites. 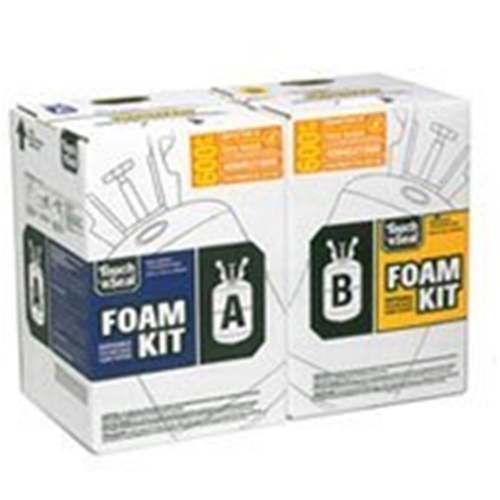 120 Spray foam kits are very easy to use and are self- contained. The Touch N Seal plural component spray foam kits can be used in new applications, but also for repairs in existing work. It is this mixture that blocks heat gain in the scorching summers and heat loss in the cold winters, therefore preventing crazy temperature changes in your home. Insulation delivers comfort and lower energy bills during the hottest and coldest times of the year. You can save up to 20% on your heating and cooling as insulation works best when air is not moving through or around it. For repairs, use the Touch N Seal kit for blisters, pitch pockets, parapet corners and more. With the Touch n’ Seal U2-120 spray foam kits, it is also an ideal spray foam kit for the do it yourself roofer. It is easily used for roofing and touch ups on your home or office roofing system. It is very lightweight and at an extremely reasonable cost, it is exactly what is needed for the do it yourself touch to keep your roof perfect all year round. Ideal for new roofing applications, repairs and touch ups. Order your Touch N Seal spray foam kits online today, or browse the Intech Equipment online store for spray foam equipment and much more!